Arctic sea ice extent averaged 13.10 million square kilometers (5.06 million square miles) for the month of May, 500,000 square kilometers (193,000 square miles) below the 1979 to 2000 average. The rate of ice extent decline for the month was -68,000 kilometers (-26,000 square miles) per day, almost 50% more than the average rate of -46,000 kilometers (18,000 square miles) per day. This rate of loss is the highest for the month of May during the satellite record. As we noted in our May post, several regions of the Arctic experienced a late-season spurt in ice growth. 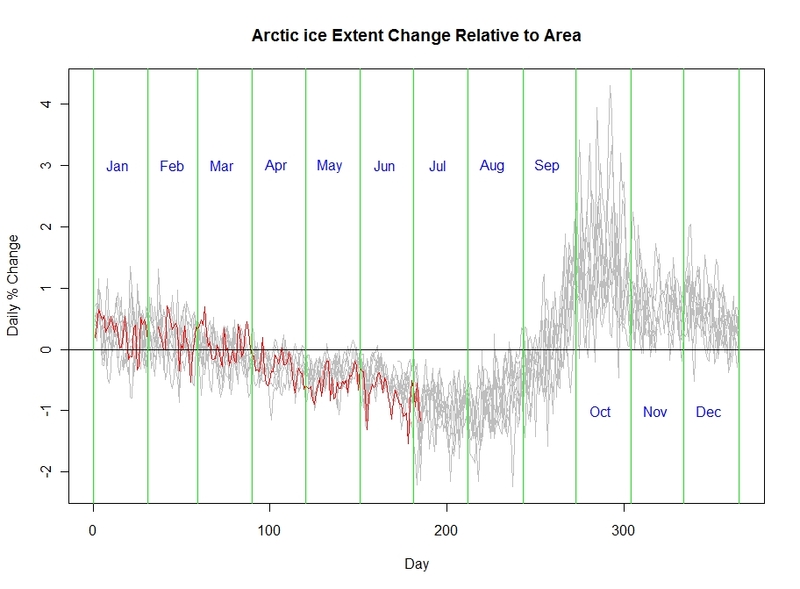 As a result, ice extent reached its seasonal maximum much later than average, and in turn the melt season began almost a month later than average. As ice began to decline in April, the rate was close to the average for that time of year. 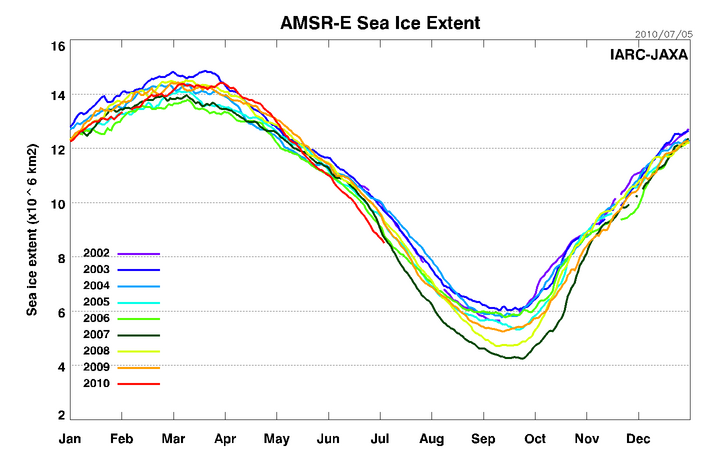 In sharp contrast, ice extent declined rapidly during the month of May. Much of the ice loss occurred in the Bering Sea and the Sea of Okhotsk, indicating that the ice in these areas was thin and susceptible to melt. Many polynyas, areas of open water in the ice pack, opened up in the regions north of Alaska, in the Canadian Arctic Islands, and in the Kara and Barents and Laptev seas. This latter observation that the seasonal maximum was reached later in the season and the melt season started later is important. Regardless of specific annual weather conditions, May and June are melt season months in the Arctic. Furthermore, if there is more ice available, then it stands to reason that more melting will take place. What might a better way to look at the data than simply plotting the total extent? Why not graph the rate of change, as well? In particular, because a wider extent will naturally imply a higher areal melt under the same melting conditions, it makes sense to look at the daily percentage change. Here, all of the years prior to 2010 are plotted in gray and the current year in red. The plot gives graphic insight into the patterns of thawing and freezing: the thaw season goes from roughly mid-March to mid-September. The very high variability in October is likely due to a reasonably similar annual speed of recovery which is expressed as a percentage of quite varied minima starting points in September. I read this post about a day after you put it up. It’s good that you’re back at it. I see your point that a daily percent change isn’t that far out of whack but of course the integral of a slight difference can add up. Imagine the difference in interpretation if the data was by second or by week. I wrote one on sea ice from the latest NSIDC post. It was supposed to be a boring update on sea ice, because globally it isn’t really changing. The NSIDC proclaimed record losses and loss rates in May and June and covered up the the record highs in the June Antarctic. I read your post and agree with you on the blatant bias of the NSIDC site. It is a shame that these guys can’t present a more reasoned and balanced view in their discussions. But hey, it is a vehicle which tends to “convert” thinking believers toward skepticism. My point was that it was misleading to look purely at the change in the amount of ice extent. When there is a greater amount at the beginning of a melt season or if conditions are less conducive for early melting, then it stands to reason that the melt rate will be faster later simply because there is a broader area over which the melt can take place. To put this into context, the melt should be expressed in relation to the total available. If one expects the effect to take place uniformly throughout the ice region, then the proportion (or percentage) is a reasonable statistic to look at. However, if the change occurs mainly at the perimeter, then using the square root of the extent would be better. For example, if the ice was a solid mass and the reduction was due to conditions at the edge of the sheet, say due to water melting or breakoff, then the latter would be the case. On the other hand, if the ice is disconnected floes and the cause for melting is solar radiation and/or ambient temperatures then I would expect the percentage change to be more appropriate for the evaluation. I chose the latter in this case. Ahh, ’tis a fine thing that you are back Roman. Your absence was rather more noticable than we expected….. and we had expected ‘twould be noticable. Did you enjoy your golfing interlude? I was just wondering what effects precipitation may have in various regions at this time of the year. ie. when is rain liquid…and if/when it is so, is its effect different on the edge of the ice pack compared to where the ice is more solid? for such an important document. Probably it is a better use of your life force to consider that entry into the ‘reconstruction derby’ of which you hinted elsewhere. EIV/TLS Regression – Why Use It?